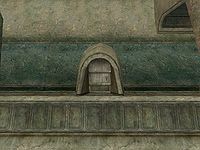 The St. Olms Waist South-Two is the residence of Dalvus Helothran accessed from outside and located on the Waistworks level in the southern part of the St. Olms canton in Vivec. 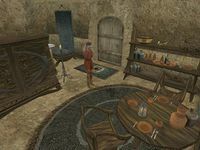 To the right as you enter is Dalvus' bed, beside which lies a bottle of mazte, a cheap restore agility potion, and a standard fire resistance potion. To your left are shelves with a fairly uncommon bug lamp, 25 gold coins, and three sacks containing random ingredients on top. There is also a closet with random common clothing and several urns containing cheap food.